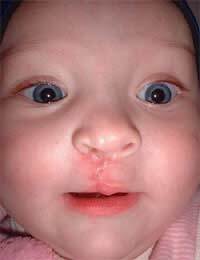 Cleft lip and palate is a birth defect that is usually diagnosed at birth. It affects the infant's upper lip and also the roof of the mouth. While there are varying degrees of it, treating cleft lip and palate is important to ensure the child can have normal speech, feeding and appearance. There are actually a number of causes of cleft lip and palate. It could be a genetic deformity passed down through the parents of the child. Or, certain drugs, viruses and other kinds of exposure during a woman's pregnancy can cause cleft lip and palate. Sometimes, cleft lip and palate doesn't occur alone; instead, other birth defects are present. Sadly, the effects of cleft lip and palate can be severe. In more minor cases it could be a small notch seen on the lip. But in severe cases, it could be a significant groove that travels the full length of the mouth and reaches the nose. Those who suffer from cleft lip and palate will usually have their appearance affected and they can also have difficulties with eating and speaking. Ear infections are another problem associated with cleft lip and palate. A child could have a cleft lip, a cleft palate or both. The diagnosis is usually done at birth through a physical examination. Surgery typically happens when the baby is between six weeks and nine months old to close the cleft lip and cleft palate. This way, it is remedied before a child begins to talk and could have their speech affected by the defect. Sometimes, more than one surgery is needed and a child could need extra support from a physician and orthodontist as they grow up. Fortunately, most children who receive treatment can expect to have a normal appearance and normal feeding and speech. There has been some attention to this problem in third world and developing countries where infants do not have access to the surgery needed to repair cleft lip and palate. Charity organisations and dental surgeons have travelled to these countries to provide the care needed free of charge but there are still many children who do not receive this relatively straightforward treatment due to limited access to medical facilities and lack of funds. When a child is diagnosed with cleft lip and palate, it can be a devastating feeling for a parent. Modern advances in treatment and surgery, however, mean that the vast majority of children who receive surgery in a timely fashion will not suffer any long-term ill effects from the birth defect. These children can expect to live normal, healthy lives.